If you’re somewhat lacking in design skills but really need a logo and a name to get your business up and running, there are a few tools out there that can help you. 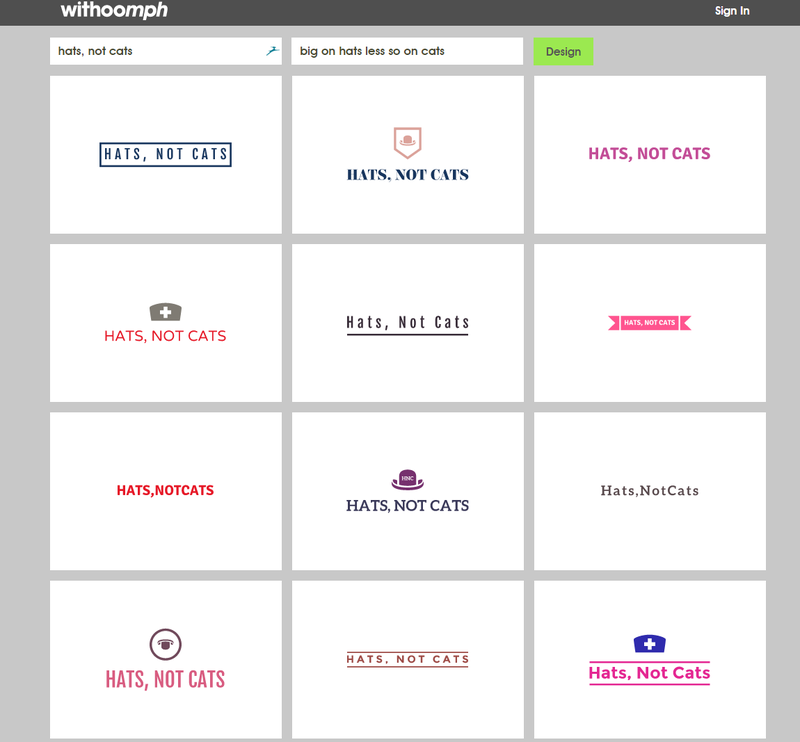 Last week, we brought you a surprisingly useful business name generator and this time around we’re looking at Withoomph’s logo creation platform. Of course, there’s always the option of designing your own from scratch if you’re handy with Photoshop and have the skills, time and inspiration to pull it off, but I’ll let you in on a (not very good) secret: I’m color-blind, which has always been enough to put me off embarking on any serious design projects. 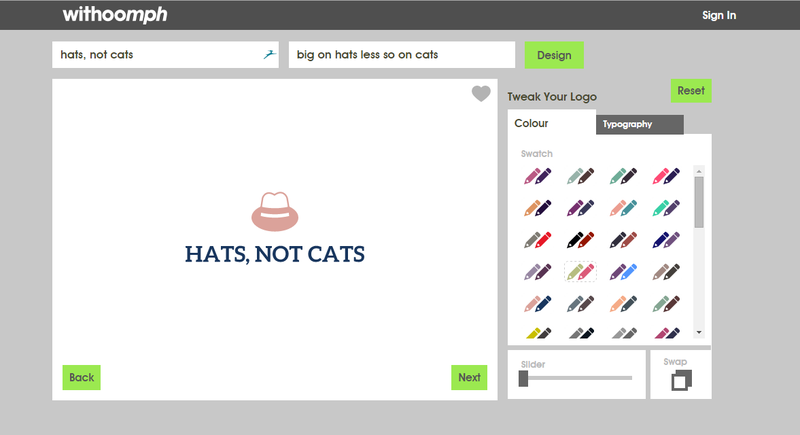 If (like me) you’re lacking in any of those pre-requisites for designing your own logo, Withoomph’s logo creation tool makes things super-simple so you can be up and running in just a few minutes. All you need to do is enter a company name, and a few keywords that relate to your business to give the system some pointers in the right direction – you can leave the keywords box blank . The first page of results you’re presented with is a page of different logos featuring your company name – if none of the first few suggested are any good, you can just scroll down and hit the ‘Design more’ button for more suggestions. Once you’ve found one you’re happy with, selecting it will take you to a new page where you can change the colors of the font and image using a color picker. The slider lets you move through different color options without individually selecting them, and the swap button reverses the colors on the logo and text. You can also change the font, case and spacing of the typography here by clicking the tab next to ‘Colour’. When you’re happy with it, the final design page shows you how it would look in a few different places – on a T-shirt, paper cup, bags, business card etc. The final step is the output options. For free, you can get a low-res 200 x 200 pixel PNG preview file. A high-res logo for screens will cost £25 (PNG & JPG) and a high-res scalabale vector logo for print (including EPF and PDF files) will cost £50. If you want all of these options, it’ll cost £70. Given that the logos are digitally-delivered, the platform is open to anyone around the world, but US pricing won’t kick in until next month, at which point the logos will cost $39, $79 and $109 respectively, a spokesperson said. However, Withoomph is running a launch promotion for the next month (until December 27) that makes the high-res logos for screens free, so there’s no need to go reaching for your wallet just yet. 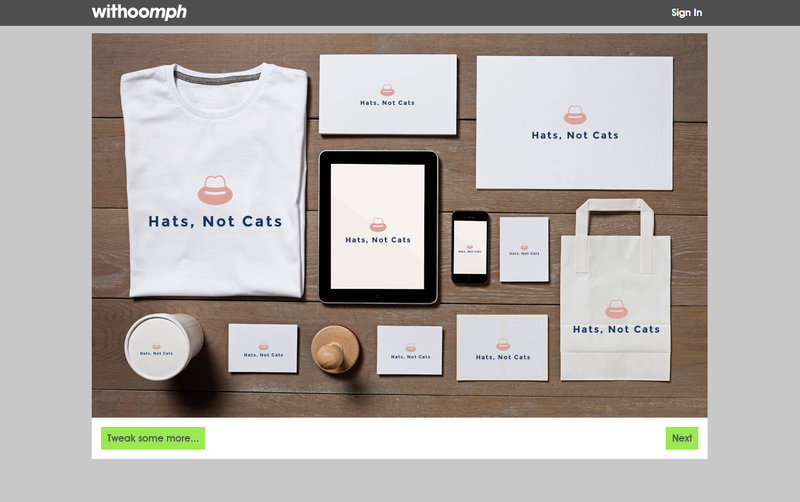 (UPDATE: Due much heavier-than-anticipated demand, Withoomph has had to end the promotion early – seeing as a it’s a bootstrapped startup, we can sympathize). Obviously, however smartly created, a platform like this isn’t going to offer you quite the same level of flexibility as designing your own or hiring someone else to do it for you – but then it won’t cost as much either, and you end up with a professional looking logo in just a few minutes. If you want more control over the process, there are other logo generators out there, but this is my new favorite for its sheer simplicity and speed.